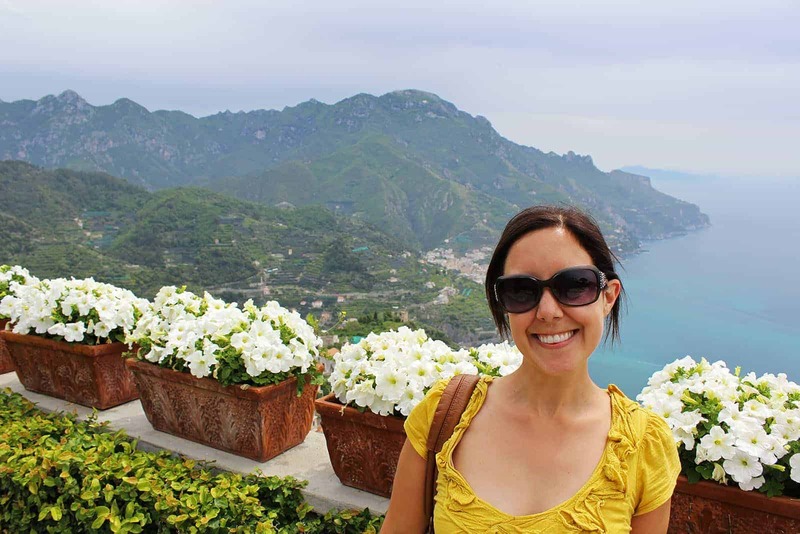 We spent our day traveling around the Amalfi Coast, and it was certainly one of our most memorable travel adventures. Justin and I booked a tour with Lovely Amalfi Coast Tours. 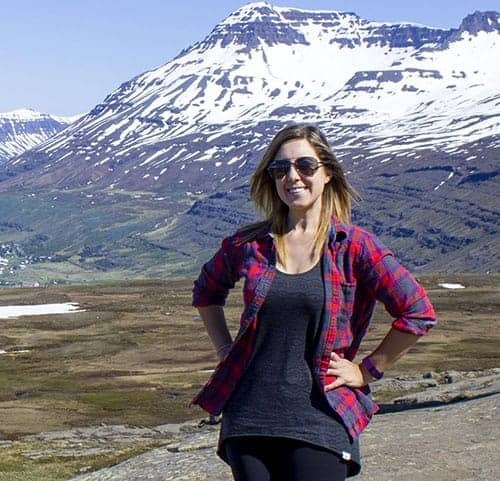 There are a number of tours in this region featured on their website, which cater to guests staying in the region or traveling from cruise ships. 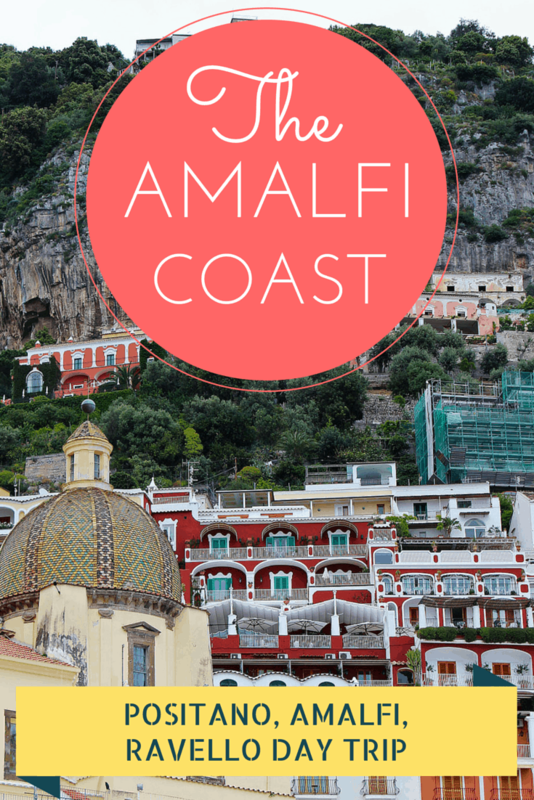 We had researched a few ways to get around the Amalfi Coast. You could take a huge bus from town to town, but it seemed crowded and inconvenient. There are also coach bus tours, but those aren’t exactly appealing to us as you get herded in a large group from place to place. Lovely Amalfi Coast Tours offers private tours with a driver who takes you from town to town, explaining the local culture and history along the way. 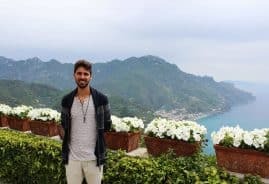 On the tour, Full Amalfi Coast, we were driven to Amalfi, Positano, and Ravello. The tour lasted 8-9 hours, which gave us a full day to explore all three places. We had free time in each town with recommendations on places to check out. Our driver, Giovanni picked us up from our apartment in Sorrento at 8:00am. We started bright and early in an effort to beat the crowds. The tour was also planned strategically to avoid the crowds as much as possible. And I have to say: it worked. Please subscribe to our Youtube channel to view all of our travel videos! 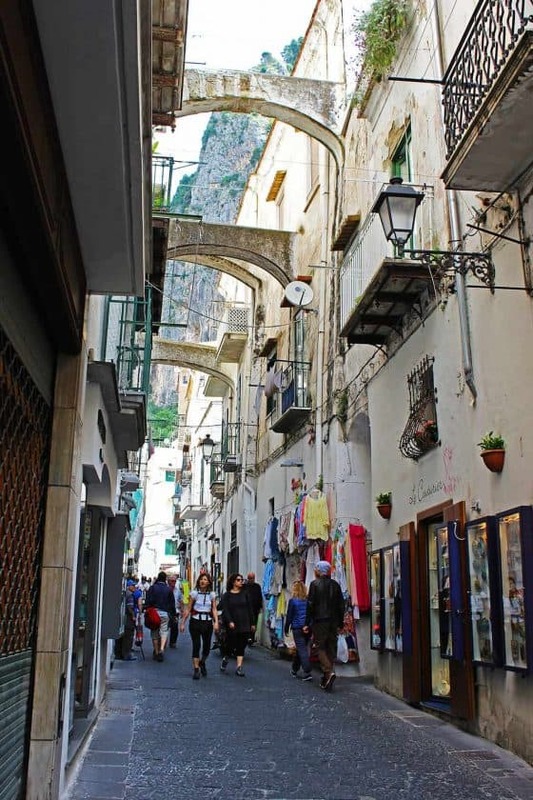 Have you ever visited the Amalfi Coast? Before stopping in any of the towns, we admired the scenery as we drove along the coast. The calm, blue waters of the sea were stunning. We were able to even see Capri off in the distance where we had visited a couple of days prior to this trip. It was great to ask Gio any questions that we had as we drove. There were two small islands that we spotted that are apparently privately owned by a very wealthy man. Could you imagine owning islands off the Amalfi Coast? Giovanni also navigated these twisted, winding roads like a pro. We were very grateful that we didn’t attempt to drive around in a rented car. The roads were so narrow at some sections. I don’t even know how those massive coach buses managed to stay on the road. 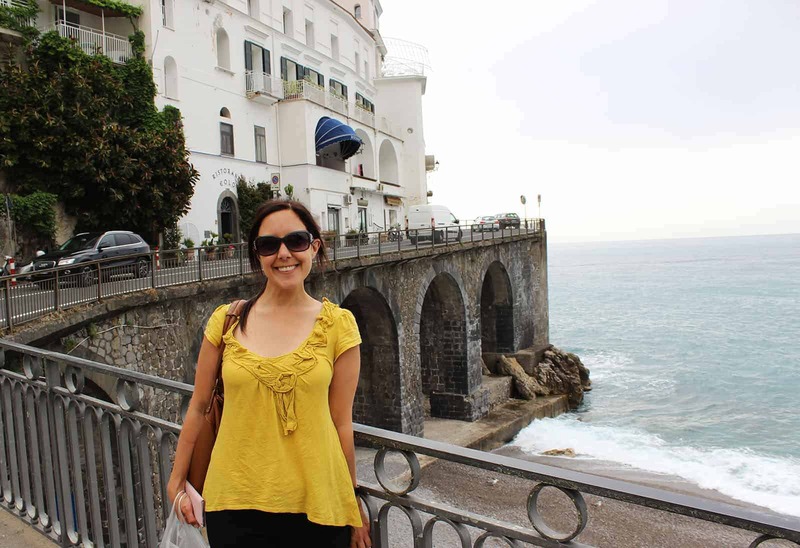 We made three different stops at various points along the coast on our way to Amalfi. These were very scenic stops where we took many photos. Giovanni also took some photos of the two of us together, and he’s familiar with using a DSLR camera. Giovanni slowly drove past this cave at the side of the road so we could catch some glimpses. So cool. The first town that we visited was Amalfi. We arrived pretty early in the morning which was a great idea to beat the crowds. Most of the large tour buses hadn’t arrived yet, and the streets were not crowded at all. It was the perfect time to explore. 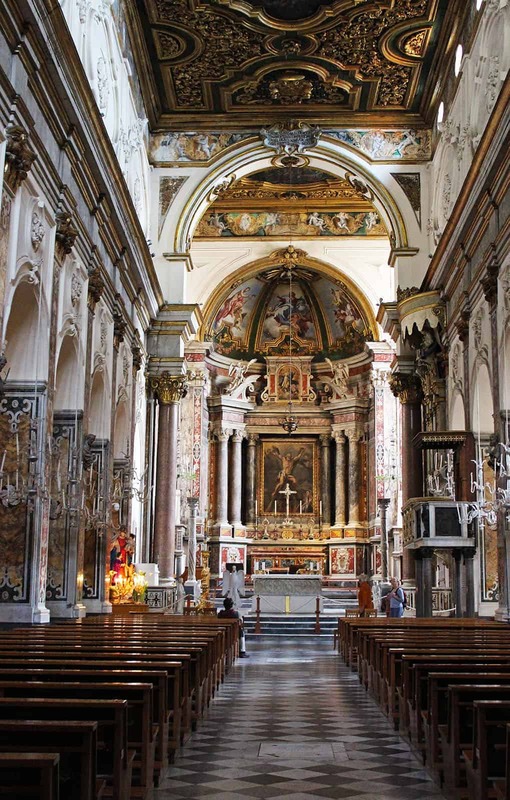 Giovanni recommended that we check out the Amalfi Cathedral in town. Otherwise, we wandered around on our own for an hour before meeting him back at the car. 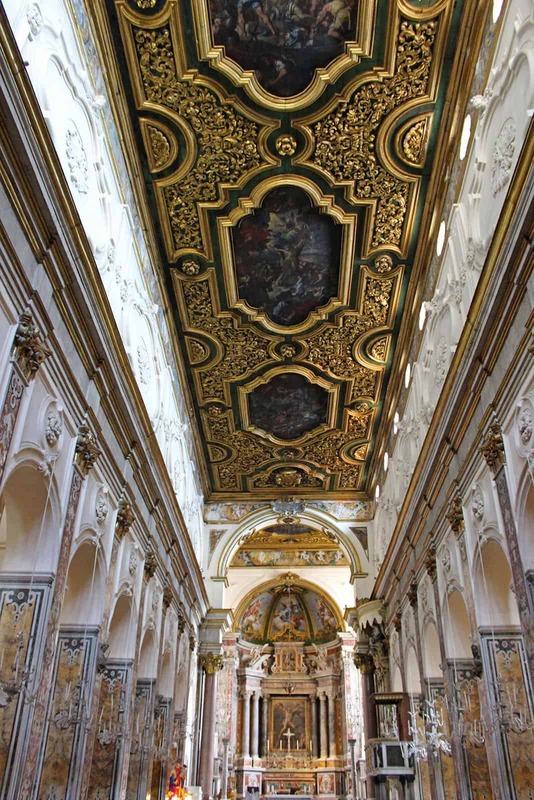 The Amalfi Cathedral was quite stunning. Located in the Piazza del Duomo, we climbed a steep staircase of 62 steps that led to the front entrance. 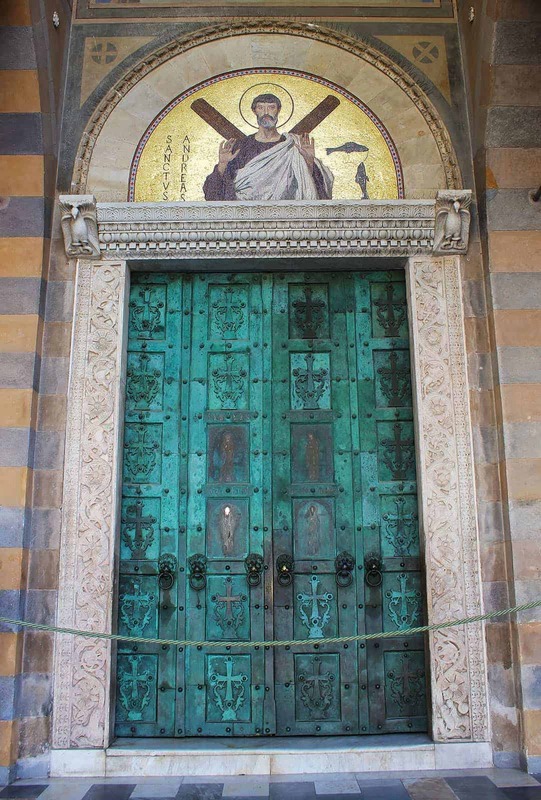 The bronze doors were cast in Constantinople before 1066; they are the oldest doors of post-Roman manufacture existing in Italy. 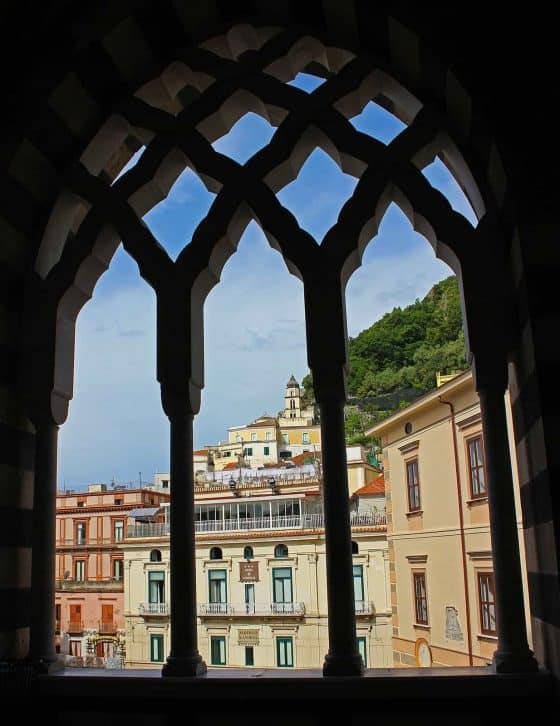 Some design aspects of the Amalfi Cathedral were influenced by Arab mosques. There were four small towers embellished with arches and decorated with majolica tiles. The front facade using striped marble was rebuilt in 1891 following the collapse of the original one. After visiting the church, we walked through the main streets of town, stopping at unique gift shops. I was dying for some coffee and stopped at a cafe for some espresso. I also found the cutest ceramics shop with some handcrafted gifts and purchased a little set of espresso mugs to bring back home. It was fun to explore the streets and admire the buildings, small markets, gardens, homes, archways, and even some decorated fountains. Brightly painted ceramics – I bought a couple of those mugs on the top shelf, second space from the left! After sauntering around town, we admired the views from the coast. The sun had disappeared behind some clouds for a short while, and the wind picked up. The waves crashed against the shore. It was one of the prettiest places we’ve ever seen. 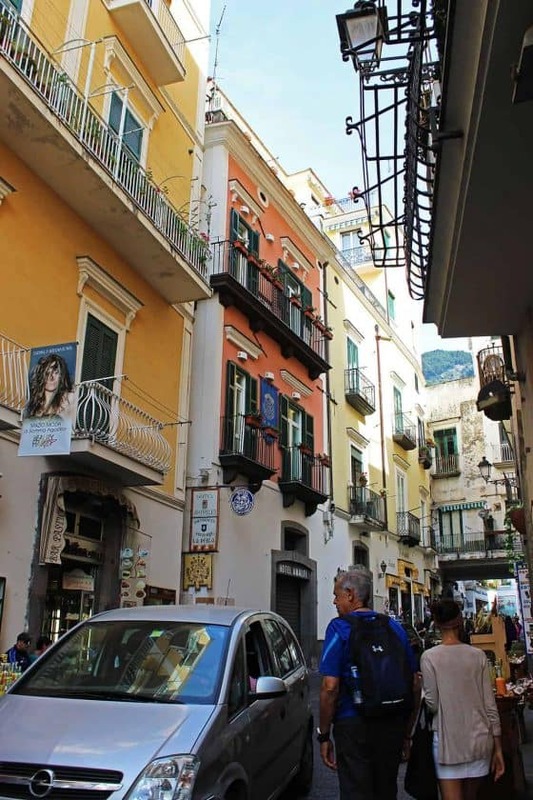 Flavio Gioia Statue – Legendary Amalfi sailor who invented the compass. 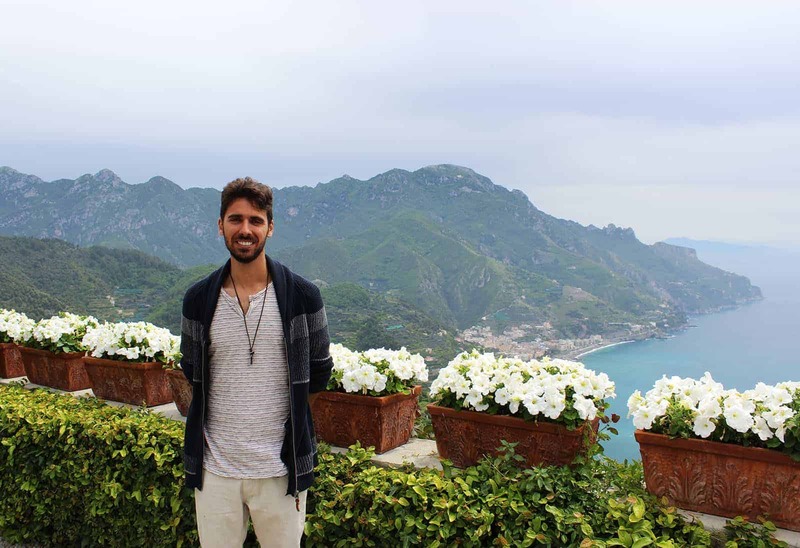 We met Giovanni at the Flavio Gioia statue and drove up the mountain to Ravello. And we thought Amalfi was pretty. 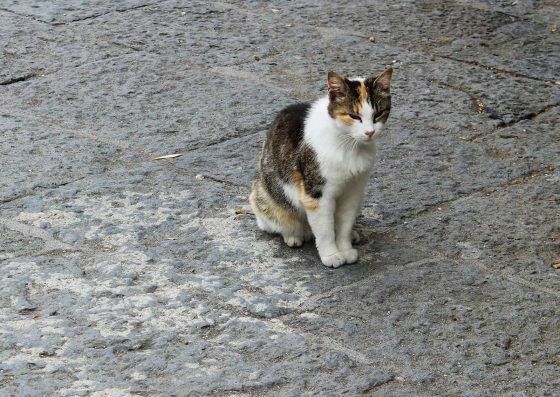 Wait until you see Ravello. 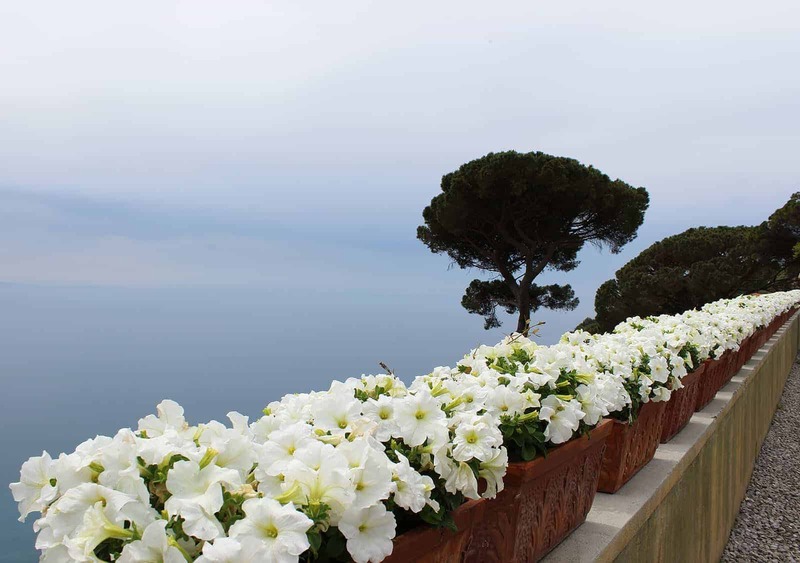 It offers stunning views of the Amalfi Coast. This town should definitely not be missed if you’re visiting the region. Oh, I forgot to mention before that the Amalfi Coast is designated as a UNESCO World Heritage Site for its beauty. Giovanni recommended that we visit Villa Rufolo, a castle and gardens within the historic city centre. Of course, even though this is a small town, we managed to take a wrong turn down a side street. However, sometimes getting lost leads to wonderful places and we discovered some small gardens and a church. It didn’t even matter that it had started to rain a little bit. Gio lent us one of his umbrellas, and before long, the skies cleared and the rain dissipated. Villa Rufolo used to belong to the prestigious Rufolo family and was constructed in the 13th century. Every year, the site hosts an exclusive music festival where attendees can enjoy music with an impressive backdrop. The gardens were beautifully landscaped, and the scenery was very impressive. It’s hard to put into words just how beautiful the views were. With our photos, you can see for yourself. The rest of these views come from various places around town. We were back in the car with Giovanni after an hour and it was time for lunch. He took us to a special location where we ate a traditional meal in the hills above Positano. We had the option to dine wherever we liked as the meal wasn’t included in the price of the tour. We decided to take Gio’s recommendation as he was familiar with all of the local dining establishments. Along the way, we stopped for a moment at a handmade nativity scene at the side of the road. We reached the restaurant in a very interesting manner – by taking an elevator a story down into the dining space! We were seated at a reserved table with a view. And what a view it was. It was one of the most gorgeous outlooks that I’d experienced at a restaurant. Once it was established that we both consumed a vegan diet, the small shared plates of food arrived. There were salads, sauteed vegetables, bean dishes, and pasta. The restaurant prides itself on growing mostly all of its own fresh produce. The food was lovingly served on painted ceramic dishes featuring the restaurant’s name. At the end, we were treated to some fresh cherries and limoncello for dessert. 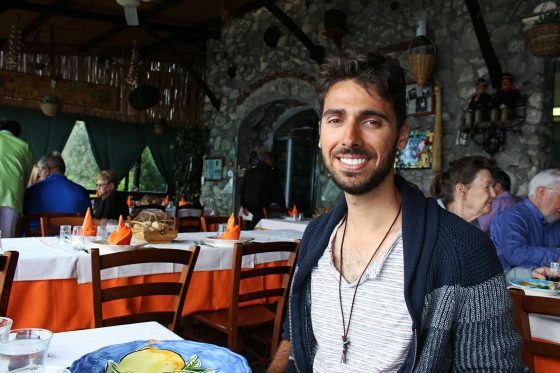 The meal was at a fixed price of 30 Euros per person. It was a little bit expensive, but the food was fresh and delicious, and the view was outstanding. The view from my seat at the restaurant overlooking their garden and the sea. Our last stop for the day was Positano. Save the best for last? Quite possibly! 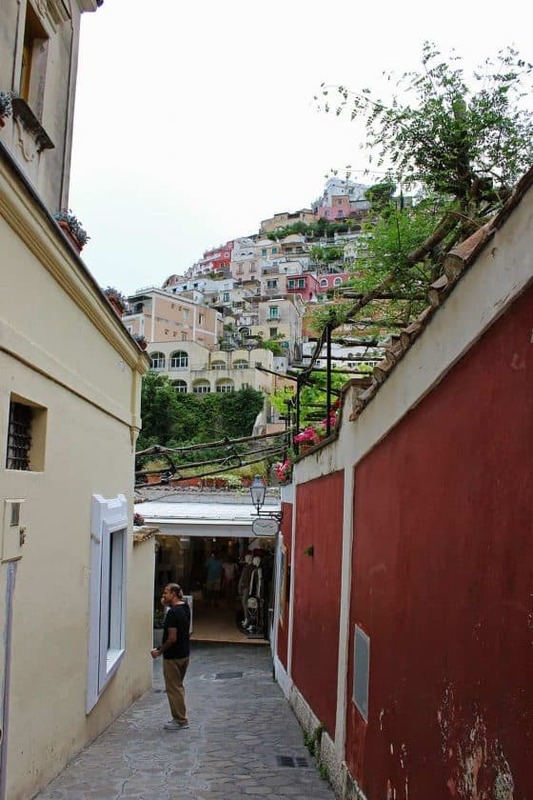 Positano was a picturesque little town with buildings stacked up the hill, slightly similar to what we viewed in Cinque Terre. There was an impressive Duomo adorned with sparkling mosaic tiles. We walked down a path to sea level where there were lots of cute cafes, restaurants, and shops. It was lovely to admire the sea and the surrounding cliffs. We spent an hour in Positano and really didn’t do too much here. We didn’t have to. The time flew by as we strolled up and down the streets, taking in our surroundings. 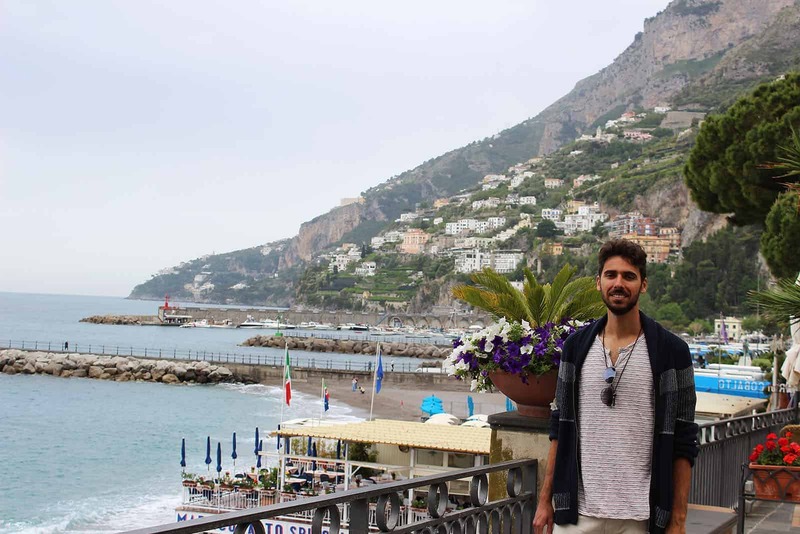 The Amalfi Coast is just one of those places you must visit in your lifetime. It’s one of the most beautiful spots in the world. On the way back, Gio treated us to a surprise and a small gift, which we won’t describe – we’ll let you experience that for yourself when you book the tour! We had a highly memorable day and we thoroughly enjoyed our tour with Lovely Amalfi Coast Tours. 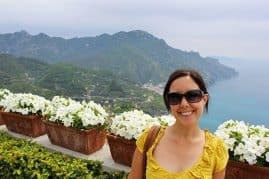 You’ve gotta book this tour when you visit the Amalfi Coast! You don’t have to worry about dealing with a large group of people on your tour. You don’t need to worry about transportation or navigating the narrow streets. And you’re touring around with a knowledgeable driver who is very friendly, helpful, and nice. You get picked up and dropped off from your hotel or the cruise ship port. It was truly a stress-free day where we could simply enjoy the places that we were visiting, the way it should be. 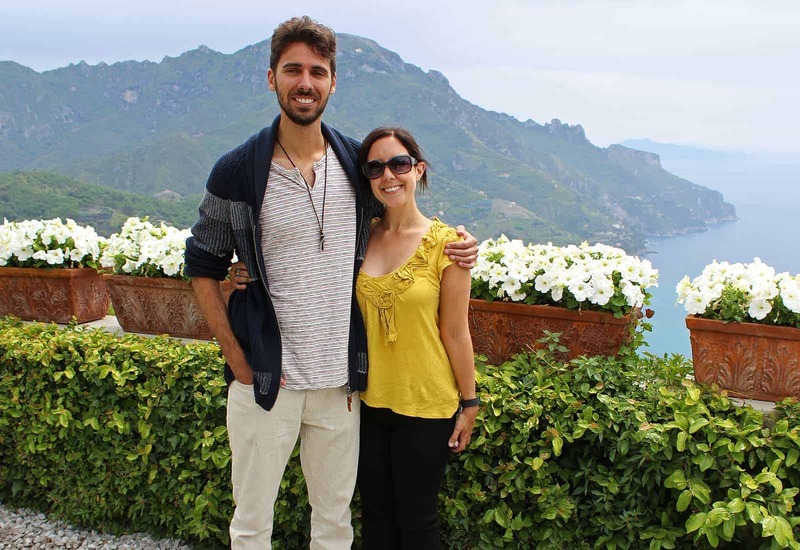 When you book your trip with Lovely Amalfi Coast Tours, be sure to let them know that Justin & Lauren highly recommended the experience to you! PIN this image to your Pinterest boards by clicking the button in the top left corner! Disclaimer: We received this tour from Lovely Amalfi Coast Tours to review for our blog. As always, our opinions are entirely our own. We highly recommend this company when visiting the Amalfi Coast as we had an incredible experience! The Amalfi Coast is absolutely beautiful. Your photos are stunning! I can see why the Amalfi Coast is so famous. That striped cathedral is especially stunning as are the views from your lunchtime restaurant. Gio certainly served you well. 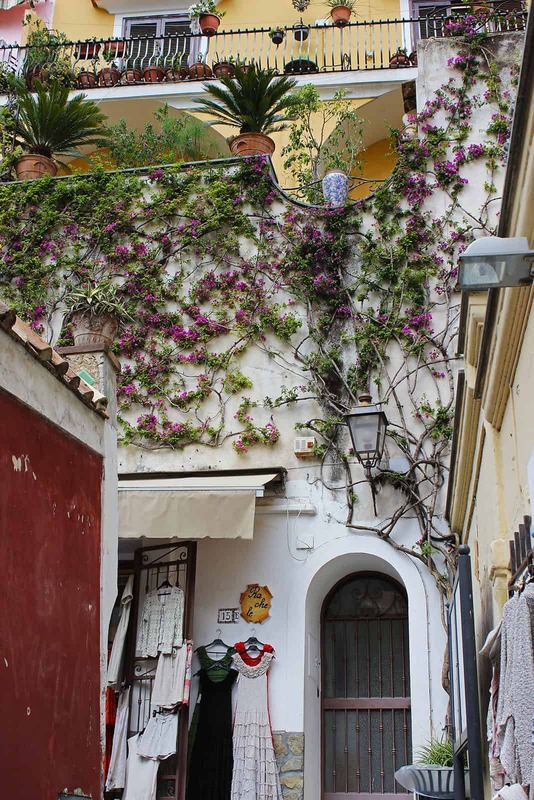 I wish we had the extra time to drive around it when we were in Sorrento last summer. I also really like having a private driver to take us around instead of a big group tour. 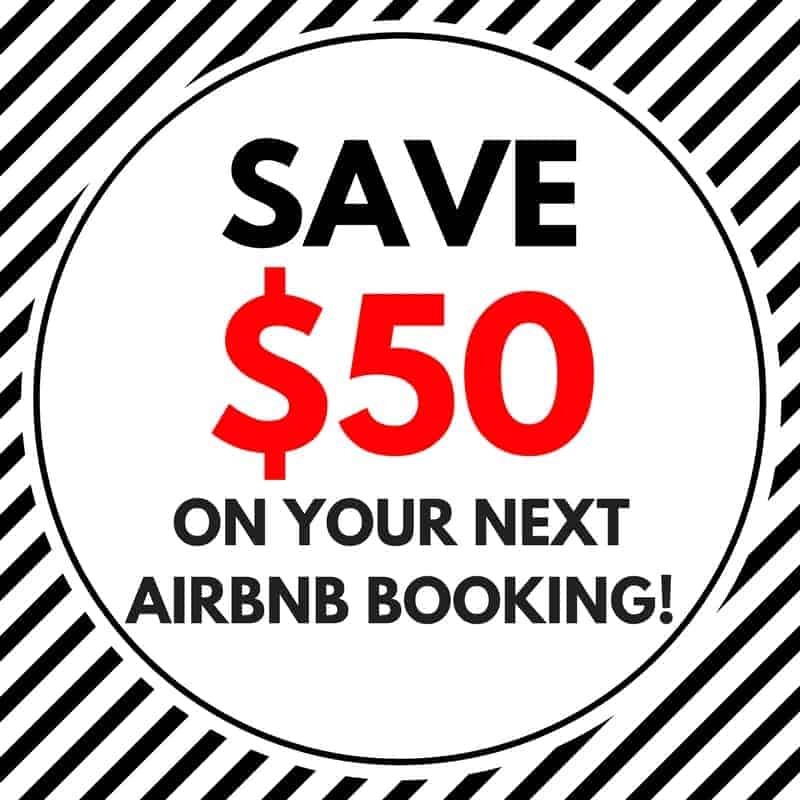 Since we’re a family of 5, it’s sometimes cheaper for us to book something private instead of paying per person for a group excursion, too. Last of all, I didn’t realize the height difference between the two of you — reminds me of myself and my guy. You had me at the first photo :) I love being by the coast, and that area looks just stunning. It was a real pleasure looking at all of your photos and the video. I do hope I’ll see this place some time, including the Amalfi Cathedral. What can be better than traveling in a place with so much natural and man-made beauty! That’s exactly the kind of tour I love – where you can go at your own pace without the hordes of people to worry about. I can’t believe you saw so much in one day! Each of those towns looks awesome. I’m definitely bookmarking this for next year when we visit there. I almost forgot to read your post I just got swept up in all those amazing photos! It sounds like you had a great tour that let you explore at your own pace. Wow! 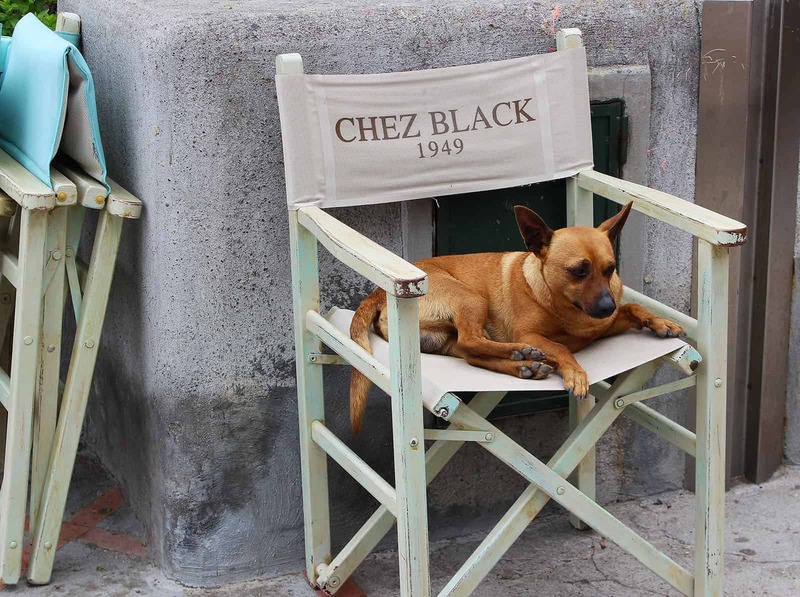 Such an awesome story and great photos! This is still a bucket-lister of mine, for sure. It just conjures up so many romantic movies. I’d never thought about taking a tour there, so thanks for sharing what a great experience that can be! Wow, gorgeous photos! i have never really seen much of the Amalfi Coast, rather I have just heard the name. Your photos are amazing and now I really want to go! Sounds like you had such an amazing time – you’re very lucky to have gotten such good weather – I love how clear all of your photos are!! We took a bus tour down to the Amalfi Coast for a day during our Italy trip a few years back now but we must have been really unlucky with the weather because it was overcast and foggy and we could hardly see anything at all…which is sad since the main reason to hit up the coast is for those amazing views!! 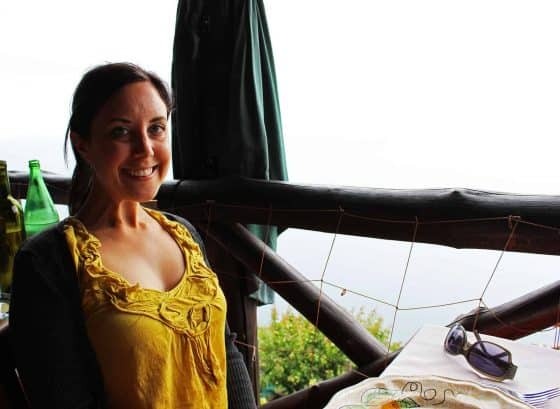 Some things are definitely better done in private tours, I think this experience would be very different doing it on your own, specially missing a lot of cultural references and historical facts. The pictures along the coast are gorgeous! We just visited Italy for the first time in May, and I definitely want to return. We had spent 4 days in Rome and rented a car for our 5th and final and were looking for somewhere to go. We first thought we might try to get down to the Amalfi coast but changed our mind when we saw how long a drive it would be. From your gorgeous photos, I see we need to go back, and I would probably want to spend at least two days exploring there! The Lovely Tours looked just that–lovely! Every photo looks like a postcard and I love that you were able to experience it at your own pace. i would really love to see a region like this. i like the idea of avoiding the crowds and getting a more intimate look at everything than being “herded” from place to place! looks like a great time! Beautiful pictures, what camera are you using ? Amazing article.Amalfi coast is really beautiful place to visit.Ocean side scene is fantasting. I really love this place. Thanks,for sharing this beautiful image of Amalfi coast . I'm Lauren, nice to meet you! I'm a part-time traveler slowly making my way around the world. Sometimes I travel with Justin, and sometimes I'm off on adventures on my own! I love hiking, cats, and coffee. You can learn more about me here.